This small plaque showing a stupa is a very intriguing one. Its square shape and uninterrupted border indicate that it is complete as it stands. Its design deftly alternates between recessed and relief modelling, for the stupa, its lateral banners, and the honeysuckle florets. 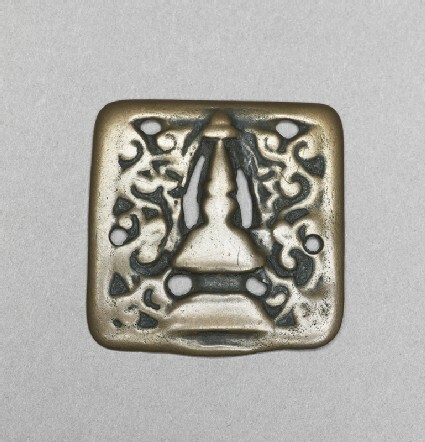 The six pierced holes are not required by the design and their position indicates that they served to attach the plaque to an object. Possibly nails were used to attach the plaque to a wooden book-cover, ostensibly for a Buddhist manuscript, or else strands of thread or leather may have been passed through the holes to use the metal as a weight on a tie surround for such a bookcover or other papers. The shape of the stupa is quite archaic and does not correspond to the typology in use after the eleventh century in Tibet. Here it still shows the long fabric banners suspended from the apex. Such banners are represented in the stupas painted at Bamiyan and Kakrak , and in stupas in mural paintings in the grottoes at Kizil, dated c. 600-650 AD . The Tibetans occupied the Kizil region during the late seventh century, then it fell to Tang China, only to return under Tibetan control during the second half of the eighth century, when the Tibetan empire in Central Asia was very strong, lasting until the mid-ninth century . Tibetan participation in trade along the Silk Routes was intense in this period, as was the correspondence and exchange of military reports between Lhasa, their capital in central Tibet, and the occupied garrisons of Central Asia. In such a system, this plaque might have served as a weight on a tie around a sheaf of reports and letters carried by horse. There were two principal itineraries from these garrisons in Kizil towards Lhasa, either along the main artery of trade via Dunhuang and then south to Lhasa, or south to Khotan and Ladakh, which was also part of the Tibetan empire. Although not perfectly identical to the shape of this stupa, clay tablets with similar stupas and ancient inscriptions in Indic alphabets have been recovered in Ladakh , as well as paintings of stupas inside ancient chorten near Alchi attributed to the late tenth to eleventh century. 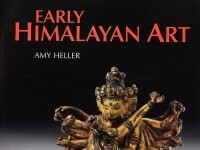 Whether inspired by stupas in Kizil or by those in Ladakh, the alloy is consistent with other tokchas believed to have been manufactured by Tibetans during this period, towards the end of the Tibetan empire and the arrival in west Tibet and Ladakh of the scions of the Tibetan dynasty. 1 The fragment of the cupola of Kakrak (h. 95 cm) is on permanent exhibition at the Musee Guimet, Paris (MG 17.901); see Klimburg-Salter, The Kingdom of Bamiyan, pl. 58, fig. 75, for the stupa at Bamiyan, and pl. 90, fig. 118, for the Kakrak stupa. 2 See Haertel and Yaldiz, Along the Ancient Silk Routes, pl. 30. This mural painting is a fragment now conserved in the Museum for Indian Art, Berlin (MIK III 8859, 8860). 3 The Tibetan occupation of the Four Garrisons (Khotan, Kucha, Karashahr, and Kashgar) began in 665-66; Kizil is part of the Kucha area: see Haertel and Yaldiz, op. cit., p. 18, for a summary of these occupations. 4 See Dorjee, Stupa and its Technology: A Tibeto-Buddhist Perspective, pp. 41-3, and Denwood, 'Temple and Rock Inscriptions of Alchi', fig. 82. Presented by Dr John Siudmak, 2000.